We were scouting cool party spaces recently and caught this view from the 9th floor of Neil Denari's HL23 on the High Line. Lower floors of the 14-story condo, now nearing completion, are going to feel pretty vulnerable to nose-pressers strolling up the rail-bed park who will be just feet away from their living room glass walls. 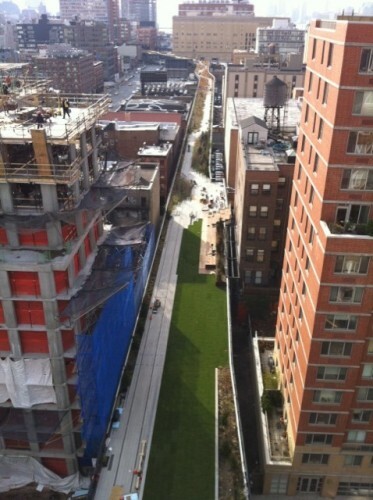 But on the upper floors, views of the length of High Line will unfurl as alluringly as the Yellow Brick Road. Right now, it's possible to make out the stretch of emerald lawn section at 23rd Street, waiting for its sunbathers. The high-end cotton label Supima is planting its flag—or rather, a field of cotton plants imported from Texas—under the High Line this summer, in a public outdoor event space designed by Brooklyn's Konyk Architecture. 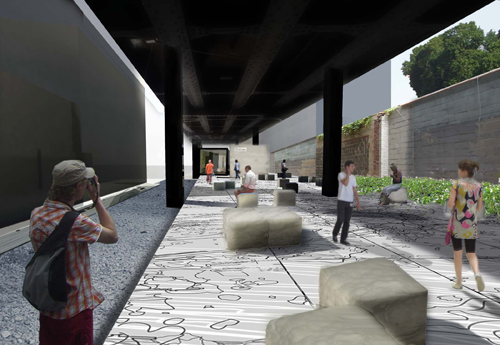 Dotted with movable cotton-bale seating and set atop a plywood "walkable mural," the space will host a variety of events beginning the week of July 15 and continues through New York Fashion Week in September, just in time for those cotton bolls to bloom beneath Neil Denari's soon-to-liftoff HL23. Konyk's competition-winning design for the 4,000-square-foot event plaza, currently a staging area for construction near 10th Avenue and 24th Street, will include a plywood "flat field" transformed by routers and jigsaws into a fiberlike landscape based on the botanical profiles of Pima cotton, recalling an expanse of pressed flowers. The reconfigurable cotton-bale seats will allow varying uses for the space, which is expected to host 500-person Fashion Week blowouts, but should also serve as a ruminative, gardenesque respite for flagging Chelsea shoppers. Sponsored by the group Building Fashion—along with Supima, the Pima cotton-growers association—the project also includes a rotating series of pop-up boutiques installed in what is known as the "HL23 Tin," a customized prefab box that currently houses the HL23 sales office. (A model apartment upstairs will take over sales duties.) To fill the space, each of five fashion lines will be paired with an architect to fit out the pop-up store, with architects selected through competitions on Architizer. The first boutique features designer Simon Spurr working with Collective, a young collaborative practice including architects Marc Dizon, George Alan, Zach Hines, and Dehlia Quellman. And rest assured, Alf Naman: there'll also be voyeuristic glimpses of HL23's glittering facade. "It's an interesting hybrid in the shadow of Neil Denari's building," said Craig Konyk of the site. "You're right under the High Line, where HL23 cantilevers over. We'll have a mirror where you can look up through a slot and see the facade as a landscape."